What is it: Third generation of the successful hybrid, with a few tune-ups. Highlights: The new 1.8-litre, 73kW engine (up from the last model's 1.5L, 57kW 'plant) is boasting improved fuel economy as well as power, redeucing fuel consumption by about 10% despite the higher displacement. The 60kW electric motor is 10kW more powerful than before. The new look Prius is apparently a better drive than its predecessor as well, claiming a better electrically assisted power steering system, revised suspension settings, wider track, and newly-developed tyres with less rolling resistance. Prius will go into the ring in Melbourne with another anticipated hybrid, Honda's Insight. Australia-bound: Expected third-quarter of this year. Australian motorists will be the first outside the United States to view the next-generation Prius hybrid car when it features on the Toyota stand at this month's Melbourne International Motor Show. In an era when multiple hybrid systems are starting to surface, Toyota is unveiling the third generation of Prius with its superior fuel economy and ultra-low emissions. Melbourne is the first public outing for new Prius since the sharper-looking but instantly recognisable car made its world debut at last month's North American International Auto Show in Detroit. 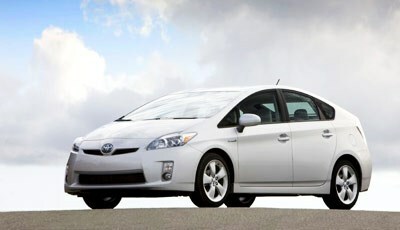 Prius is the world's most successful hybrid car with more than 1.2 million sales, including almost 12,000 in Australia. Toyota Australia's senior executive director sales and marketing David Buttner said the decision to show new Prius in Melbourne indicated the importance of Toyota's Hybrid Synergy Drive technology to Australia. "It is a real coup to be able to show the new Prius at Melbourne, well ahead of its local launch early in the second half of this year," Mr Buttner said. "Significantly, the name Prius is Latin for 'to go before' - a fitting name for a car that epitomised environmental awareness long before it became a mainstream social issue. "In keeping with its name, new Prius is also the fore-runner of another hybrid vehicle with even more importance for Australia. "Early next year, Toyota will become the first local manufacturer to produce a hybrid vehicle when we release the hybrid Camry from our Altona plant in Melbourne's west." The third-generation Prius features significant improvements to Toyota's patented Hybrid Synergy Drive technology. As a result, new Prius achieves the remarkable feat of even better fuel economy while also gaining a bigger engine and improved performance. It features a 1.8-litre engine compared with the current car's 1.5-litre engine, improving its performance and economy, especially on the highway. It is expected to accelerate more briskly, yet consume approximately 10 per cent less fuel on the official combined cycle. Unlike most other hybrid vehicles available, Prius has been a "full" hybrid since introduction. This allows it to run on engine alone, battery alone, or a combination of both - and to charge the batteries while the car is running. Mr Buttner said the new car's styling is sharper, sportier and more aerodynamic - with the best aerodynamic profile of any mass-produced vehicle in the world. "New Prius is quieter, roomier and equipped with advanced technology and innovative design features. "While Prius will satisfy those who demand ultra-low emissions, it is now also a mainstream car with great performance and more space," he said.